I have a thing for small Colorado mountain towns. I love them. That’s why we have our mountain home in Nederland, and a mountain home in Crested Butte (8800 feet above sea level). We’ve been traveling through the backroads and backcountry around this gorgeous area since 2005 and only in the last few years have we begun to discover the sparkling gem that is the town and community of Crested Butte. Adventure and scenery abound here, but did you know there is also an impressive food scene as well as a terrific organic farmer’s market (summer only)? And every single person in this town is so nice. Seriously. The nicest people anywhere. When I find something I like (particularly food-related), I’ll photograph and write about it on the blog. This page is for my posts on positive Crested Butte experiences that you may want to try when you visit this amazing paradise in the Rockies. Since I’ve had several friends and strangers ask me for dining recommendations in Crested Butte, I’m going to start listing them all here – even if I don’t have a review post published. It takes some time and work to write up a post (several visits throughout the year on my dime, photos in decent lighting, trying different things on the menu), so some of the favorites listed will eventually get a review post to which I shall link. Of course, sometimes I visit a restaurant three or four times and then it goes out of business. Total bummer (Lobar was my absolute favorite). If your tried and true restaurants aren’t listed here, I’m sorry. Either I haven’t gotten around to trying them yet, or I wasn’t especially moved to go back. Restaurant names in italics haven’t been reviewed yet. Restaurant names highlighted as a link have been reviewed. Bonez – tequila bar and grill. If you are in the mood for some upbeat and creative Mexican cuisine with lots of great libations in a hip and happening place, go here. The happy hour is outstanding. Camp 4 Coffee – serving up some of the finest coffee in the state with local style and heart. The Dogwood – cocktails. Leave the kids at home and enjoy outstanding cocktails in this cozy historic cabin. They have some really impressive small plates to go along with those drinks, too. Magic Meadows Yurt Dinners – a special night ski/gourmet dinner at the Magic Meadows Yurt that only happens in winter. It is magical. McGill’s – breakfast and lunch. Hearty homestyle breakfast fare all day. Good burgers, salads, sandwiches, and shakes/floats from their soda fountain. Montanya Distillers Tasting Room – craft rum tastings, distillery tours, crazy good cocktails (and mocktails), incredible street food and appetizers with Asian and Latin fusion, and live music. Another great Crested Butte restaurant that knocks it out of the park. Another favorite that is a must-visit. Paradise Café – Big selection of tasty breakfast, brunch, and lunch items. Pitas in Paradise – gyros, falafel, salads, fries, pitas, burgers, rice bowls, and a super delish soup bar. The Secret Stash – best pizza in Crested Butte. Heck, it’s my favorite pizza in the state of Colorado. The perfect place for your après ski (or après hike or après mountain bike) year round. The Slogar – Fried chicken or steak dinners with bottomless sides and fixings served up family-style. The fried chicken is what Slogar is known for, and then you get biscuits, strawberry preserves, slaw, mashed potatoes, creamed corn, gravy, and ice cream at the end. Soupçon – a French American bistro set in a charming little miner’s cabin in downtown Crested Butte. This is the best of fine dining in town and ranks among my favorite fine dining establishments in the state. Soupçon is special… and popular. Make a reservation and get ready for a most memorable evening. Supper at Sunflower – Spanish-inspired farm to table cuisine in downtown Crested Butte. Wonderfully creative fresh food, great wines, casual and friendly. Supper at Sunflower is one of our favorites. Uley’s Cabin and Ice Bar/Sleigh Ride Dinner at Uley’s Cabin – a charming, cozy little nook on the mountain that you have to ski/ride or take a sleigh ride to get to. Stop in for a drink at the Ice Bar (made of ice), grab a quick lunch outside, sit down for a fancy lunch inside, or sign up for the ultimate sleigh ride 5-course dinner at Uley’s Cabin after the mountain closes. The Last Steep – reasonably priced and family owned and operated…will be visiting soon for spring fishing!!! So many places this Colorado native has yet to visit in Colorado. 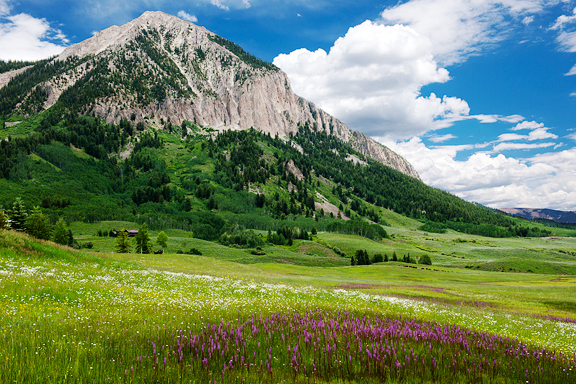 Love your view of Crested Butte. Need to put that on my short list of places to visit. Any updates on “must-dos” in Crested Butte? I’m headed there is September and want to experience all the splendor! Hi! – I just clicked through a link to the Thai Firecracker Shrimp recipe & thought I would check out the rest of your page. I grew up in Gunnison/Crested Butte (my parents still live in Gunny, semi-retired) so it is kind of neat to see a piece of home out on the internet, plus some good-looking recipes, i might add! Thanks, I’ve got you bookmarked & i’ll try some of your stuff out soon.